Embarrassed by your eczema? You’re not alone – there are 30 million of us in the U.S. We hide our red, irritated skin under long sleeves. Swimsuit season causes us severe anxiety. And if a flare-up occurs on our wedding day, should we wear a windbreaker over our open-backed dress? (Um, we’re asking for a friend). The kids at school made fun of us, sure. But at least we’re in good company. Singing superstar and eczema sufferer LeAnn Rimes was called “scaly girl.” And Kate Middleton looks perfect with baby Charlotte on magazine covers, but mean girls bullied the future Catherine, Duchess of Cambridge about her skin. Let’s band together, fellow ecze-maniacs! We may not have a cure, but we’ve got each other. Oh, and here’s a handy list of do’s and dont’s to keep our skin feeling and looking great. Because the top eczema treatment is prevention. DON’T: Take long, hot baths or showers. We’re trained to scrub our skins under the hottest water we can handle, as often as we can, and for long as we can stand it. Danger! This strips our skin of the moisture it needs to keep our eczema under control. Baby your skin every day, and make hot baths a sometimes thing. (Eczema Pro Tip: we all know a hot bath relieves muscle soreness. But when our eczema rears its scaly head, a heating pad or hot water bottle is a better option). DO: Use mild soap and body wash, or none at all. Why? Regular soap is very drying, and the fragrances in bath gels and body washes can irritate sensitive skin. Your best bet is to seek out mild, unscented baby wash, and to avoid any kind of soap during flare-ups. First of all: ouch! Alcohol is harsh, and it stings. Secondly, isopropyl alcohol evaporates quickly, taking skin moisture with it. Even if your skin isn’t red or broken, avoid alcohol and products containing a high concentration of alcohol. Apply a layer of lotion right after you wash any part of your skin, whether it’s your whole body, or just your hands. Hands are especially prone to eczema, so be sure to replace the lost moisture after washing. The best lotion for eczema? Preferably unscented, low in alcohol, and high in known soothing ingredients such as oatmeal, vitamin E, and mineral oil. Apply it at bedtime, too, so moisturizer has a chance to absorb into the skin overnight. Some people find that exposure to sunlight can help with their symptoms, and some dermatologists prescribe UV light therapy. But watch out! An itchy, peeling case of sunburn can make eczema much worse, and hot temperatures in general can cause flare-ups. DO: Know and avoid your triggers. Some known triggers for eczema: animal dander, wool, dust, perfume, certain foods, cleaning chemicals, cold weather, stress, and sweating. Whew! Luckily, most people don’t have a list this long. So figure out which are yours, and protect yourself. We know, we know. The itching can be unbearable. Some of us even scratch when we’re asleep! But scratching breaks down and irritates skin further, and increases the danger of infection. DO: Make Blue Star Ointment as part of your eczema care routine. Did you know that Blue Star Ointment contains several recommended ingredients that keep eczema flare-ups at bay? Camphor soothes the itch, while lanolin and mineral oil moisturize and protect dry skin. Another Blue Star Ointment ingredient, salicylic acid, helps to shed dead skin cells and soften scaly patches. An added bonus: ointments stay on the skin longer than creams or lotions, making Blue Star Ointment a great choice at bedtime. That’s five eczema remedies in one jar! Wouldn’t it be great if there were a foolproof eczema cure? We wish we could get rid of eczema permanently by taking a pill, or eating ice cream, or wearing a magic tiara (let us know if that works, Duchess Catherine!) One day, medical science will find a way to free us from our itchiness and embarrassment. 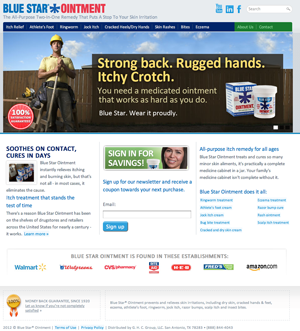 Meanwhile, we can protect our skin and prevent flare-ups with Blue Star Ointment. And a little ice cream now and then won’t hurt. Previous Post - Athlete’s: Trouble Afoot?